Some thunderstorms and rain showers are likely late today, though most of the area will miss out on both storms and rain. More detail follows in this video. Also covered is my forecast update for Easter. LUBBOCK, TX (KCBD) - Some thunderstorms and rain showers are likely in our area late today, though most of the area will miss out on both storms and rain. More detail follows in this post and in today’s video. 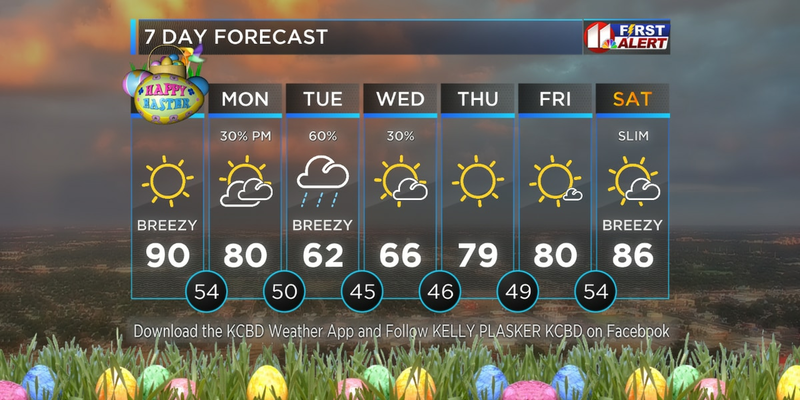 Also in our forecast through the holiday weekend: More wind, temperature ups and downs, the next chance of rain, and my Easter forecast. Moisture at low levels surged westward overnight, bringing low clouds and patchy fog to the South Plains this morning. The fog is expected to erode by around mid-morning and the low clouds to give way to a partly cloudy sky this afternoon. Wind, light this morning, will gradually increase to breezy late this morning and windy this afternoon. High temperatures in the viewing area will range from the low and mid-70s northwest to the low 80s southeast. Much more detail can be found in our forecast here on our Weather Page. You can access even more forecast detail by entering the zip code for any location of interest in the box in the upper left of the currents area. After entering the zip code select the location name that appears below the box. The currents and forecast sections will now be for the new location. To change back, just click the pencil to the right of the location name. Select from the list of locations, which you previously entered, when it appears. A few thunderstorms, based on this morning's data, appear likely around the northwestern and northcentral viewing area this evening. The storms will bring the greatest rain potential. Elsewhere rain chances will be slight and amounts light. As storms track south or southeast the activity will transition to rain showers. 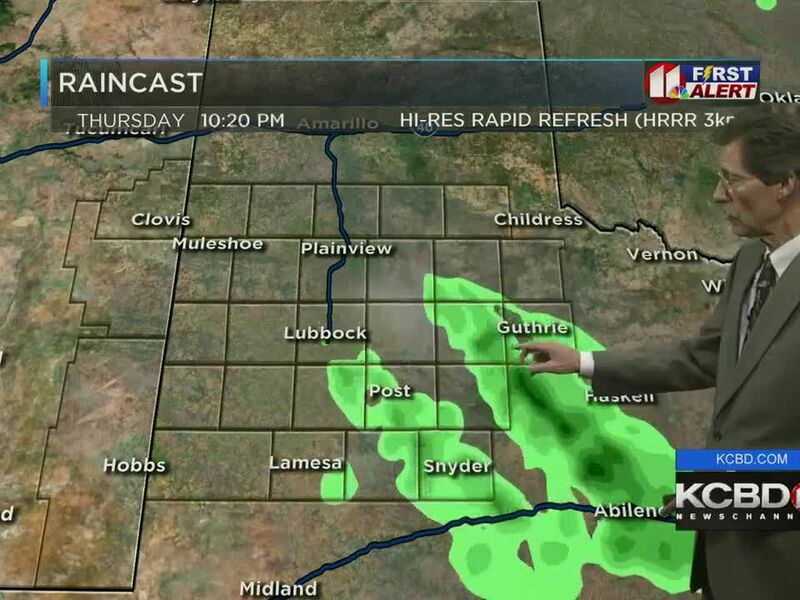 For Lubbock, the most likely time for rain is near or just after midnight, but again the chance is slight and the amount will be light. Rain will exit to the east before sunrise, except possibly for lingering rain showers over the southeastern viewing area until about mid-morning. 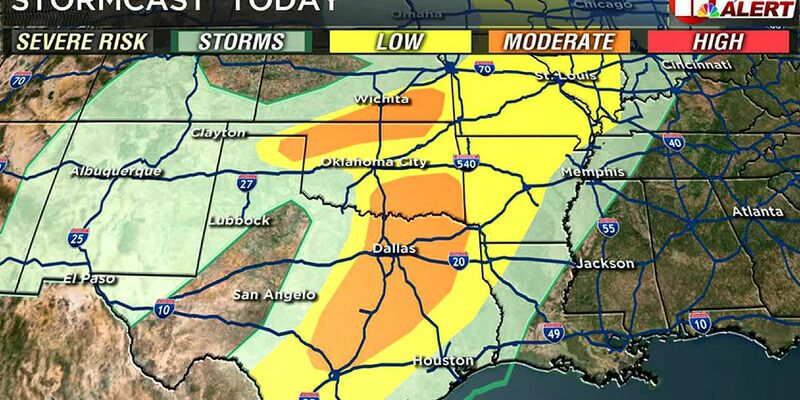 At this time severe weather is not expected, but some of the evening storms may be strong. Please watch for updates. Please remember on windy days we typically have an elevated fire weather danger, and critical conditions may exist at times. When outside avoid open flames, keep vehicles and equipment with hot exhaust systems away from dry grasses, avoid activity that may generate sparks (such as dragging chains), and (if you are a smoker) use extreme care with your ashes and butts. Use the Alert Layer (highlight the "Other" icon) in our Interactive Radar inside our Weather Apps to check on Fire Weather Watches and Fire Weather Warnings (aka Red Flag Warnings). More wind and a little less warmth highlight my Thursday forecast. Clouds may linger into the morning, but the day will be mostly sunny. Highs will range from the mid-60s northwest to mid-70s south. Less wind and a little more warmth highlight my Friday forecast. With a sunny sky I expect a "slight" breeze (mostly in a 5 to 15 mph range) and highs mostly in the 70s. Wind returns and so do the very warm afternoon temperatures Saturday. Highs will return to the 80s with the warmest - or hottest - spots around 90 degrees or a bit above. 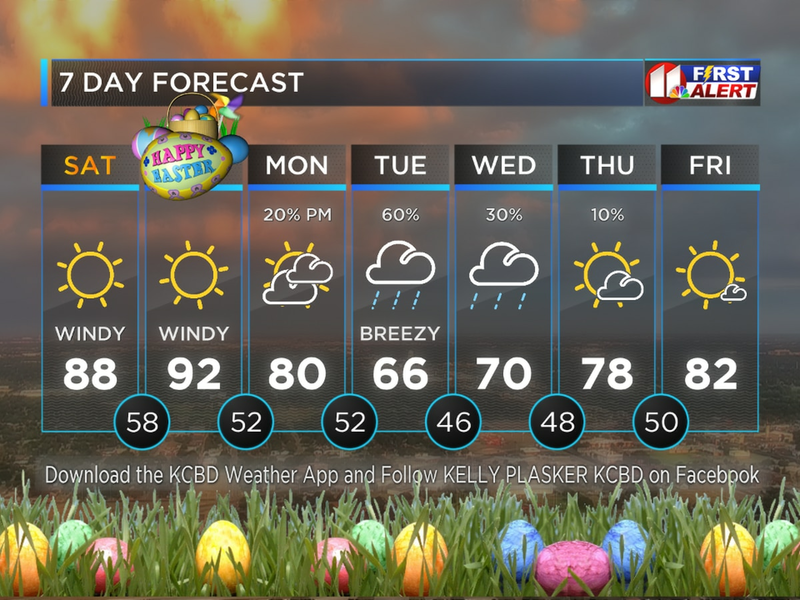 Easter is covered in the forecast here (as well as in our Weather App), but in general we expect it will begin partly cloudy, beginning somewhat windy and cool and by late afternoon breezy and very warm. I've been mentioning, at least on-air, that the next weather system that may bring precipitation is likely around Monday - but if it arrives early it may affect Easter. Currently most guidance continues to hold the system off until Monday. As such, our forecast remains dry through the holiday weekend. If this changes it would be to introduce a slight chance of rain to Easter afternoon. Lubbock’s low yesterday was 52°, six degrees above the average for the date. The high was 74°, two degrees below the average for the date. The April 16 record low is 31° (1947) and the record high 100° (1925). For today, April 17, Lubbock’s average low is 46° and the high 76°. The record low is 23° (1921) and the record high 94° (1925 and 2006). Today's sunset in Lubbock will be at 8:20 PM CDT and tomorrow's sunrise at 7:13 AM CDT. April 17, 1970: An exceptionally rare nighttime outbreak of violent tornadoes struck populated centers in the Texas South Plains and Panhandle killing 23 people and causing extensive damage. The outbreak was very unusual in that some of the tornadoes occurred during fog, at times dense, and were accompanied by very little lightning. This made nighttime spotting nearly impossible. The weather for much of the afternoon, abundant fog and low clouds with temperatures only in the 50s and 60s, did not suggest such a historic event. However, unusually moist air with dewpoints near 70° moved into West Texas on gusty southeasterly winds. An east-west oriented warm front began surging north into the South Plains by late afternoon, at which point a dryline in southeast New Mexico erupted with scattered supercells. The first violent tornado touched down after sunset in Whiteface and then hit Whitharral. The Witharral Postmaster said "The tornado was not the usual funnel shape, but more like a rain cloud. It hit Whitharral like a ball of fire, lighting the entire town with electricity picked up when it hit power lines". This half-mile wide F4 tornado caused 20 injuries and $2M in damage in Whiteface, four injuries and $700,000 damage in Whitharral, and hail up to four inches in diameter. Tornadic supercells developed late in the night near Lazbuddie, Cotton Center and Tulia. All were recorded as long-tracked F4 tornadoes. The Lazbuddie tornado was perhaps the most significant (from a meteorological perspective) as it was on the ground for just over two hours from Lazbuddie all the way into the northeast Texas Panhandle, hitting Pampa and injuring ten people and damaging 20 homes. The Cotton Center tornado moved across southwest and northeast Plainview, killing two people, injuring forty and causing catastrophic damage. Nearly every structure was leveled, some swept clean away leaving only a concrete slab. Eyewitness accounts in Plainview stated that there was little noise associated with this tornado when it struck and that it was completely hidden from view due to thick fog and sparse lightning. The tornado continued on a nearly straight line northeast into Silverton, where a 14 year-old girl was killed. Two 50-foot-tall tanks of grain were moved a 1/4 mile and a 1.5-million-bushel tank was moved 50 feet. Yet another tornado, which touched down northeast of Tulia, moved northeast in a straight line passing northwest of Clarendon before dissipating north of McLean. Sadly, 15 people were killed west-northwest of Clarendon. Most lived in mobile homes at Green Belt Reservoir in the Sherwood Shores resort community, where 172 mobile homes were destroyed. The tornado also blew several tank cars off the railroad tracks near I-40. The exact number of tornadoes from this outbreak is unknown, largely due to the unusual time of this event and the lack of comprehensive storm damage surveys at the time. Considering the magnitude, it is likely that several more tornadoes occurred than the four recorded in the official 1970 Storm Data publication. Just three weeks later, another violent nighttime tornado would occur on the South Plains, this time in the city of Lubbock. On This Date is compiled from the records of the National Weather Service, Caprock Weather, as well as KCBD.